Your free CaringBridge website or Mobile App has all the tools you need to keep your family and friends updated during a difficult time. Because we’re a nonprofit, we put your needs first. A health crisis throws everything into chaos. Because your family and friends care, questions and phone calls won’t stop and stuff begins to pile up. 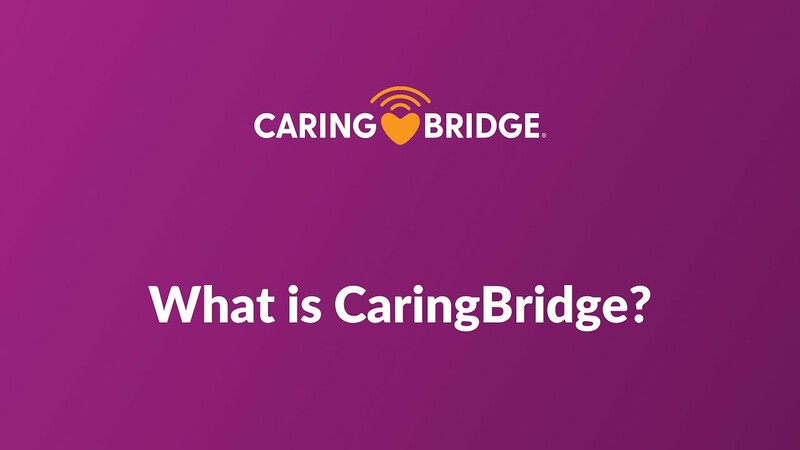 Your personal CaringBridge website gives you one centralized, private place to share health updates and request help. It’s easy to start a personalized, advertisement-free site. You can create a website for yourself or someone else in less than 5 minutes. 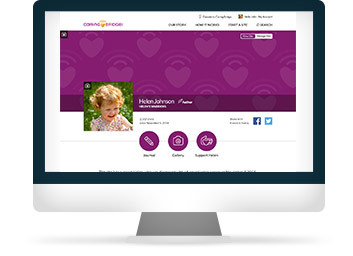 Give your CaringBridge website a name, add a main site photo and select a cover photo. Tell people what’s happening with a quick update or longer Journal entry. Your site is all about your illness or injury and what you need to say and hear. Write a message explaining ways family and friends can best help you—because they want to help you. 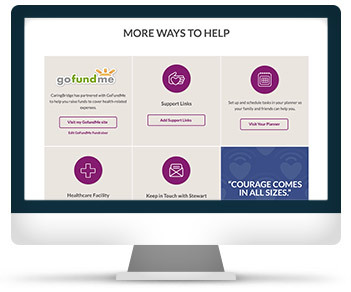 You can even link your CaringBridge website to a personal fundraiser or other helpful tools. Invite people to visit or share a link on other social media sites. A CaringBridge website provides all the information your family and friends need so they can give you all the support you need. See your story unfold as you post Journal entries and your site visitors respond with words of encouragement. Your home page incorporates a feed of Well Wishes and Journal comments, drawing your whole community closer in exchanging meaningful thoughts. 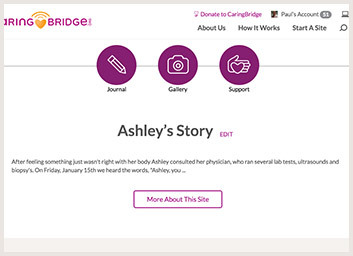 Introduce family and friends to your story with a brief background of what led to starting your CaringBridge website. You can summarize the diagnosis and make sure everyone gets the same information. It’s an easy place for new visitors to start. 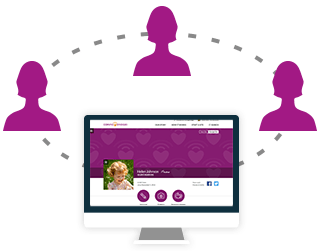 CaringBridge is an easy place to update all your family and friends, making your health journey just a little bit easier for you. Use the Journal as an outlet to inform visitors of a diagnosis and share updates during treatment and recovery. You can also mark milestones and share photos or videos in your Journal. Your family and friends can respond directly to each update with comments and messages of encouragement. Your family and friends can leave you Well Wish messages, offering words of encouragement and stories, memories, photos and videos of their own or one of our beautiful CarePost™ graphic images. These uplifting messages of love and hope give strength. 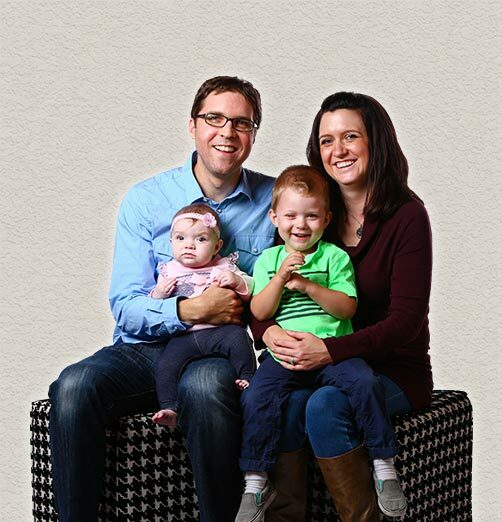 Easily add as many photos as you’d like to your website to share your memories and milestones through more than words. Your family and friends can view and comment on your photos. 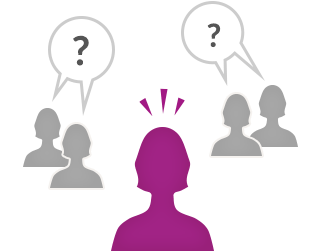 You post a new update on CaringBridge and everyone who follows your site is immediately informed with an email or text message. Each person can customize their notification preferences. People like you make CaringBridge possible. When you donate in honor of your loved one, your Tribute donation means that CaringBridge is always available, free of charge and designed to make each health journey easier. 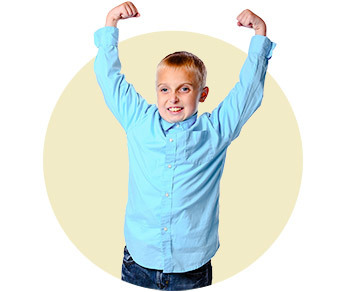 Every dollar donated to CaringBridge connects 5 people who become stronger together. Your family and friends want to know how they can help. This is your place to tell them. Let them know your needs, when you want visitors, hospital or facility information and how to contact you. Link your CaringBridge website with your favorite tools, like a personal fundraiser or calendar. Let CaringBridge serve as the hub of help during a difficult and hectic time. A health crisis can create a financial burden. You can create a personal fundraiser with GoFundMe so your friends can easily find and participate in your campaign. Your visitors will see this on your Ways to Help page. We provide a safe, protected, ad-free space to communicate during a health journey. Your personal data is never sold. You can customize your privacy settings to control access and see who’s visiting and following your site. It’s up to you if you want to have your site searchable on the web by search engines like Google. See our commitment to privacy. 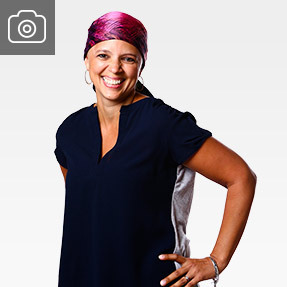 Your CaringBridge website is all about you and your story. Select the cover photo that you like best, give your site a title and personalize with photos. You can switch the main site and cover photos any time. CaringBridge helped our family and friends provide much-needed support, and the added benefit is that it’s a great tool to keep a medical journal. And it’s all in one place, without any of the noise that comes with other social networks—and without any of the ads or security concerns, too. It is a place just for us, and families like ours.